Why do you want to be an approved member? : I want to share my cc and see what others are making. 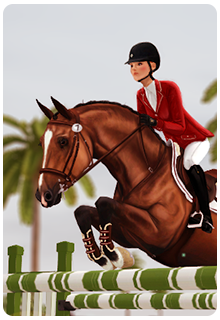 Tell us about your stables: I have several stables, which all reside under the main entity, York Equestrian. I have Canterbury Park, for competition horses. Carolan Estate for breeding, and Foxwood for retired horses and an off the track thoroughbred project. Unfortunately I have lost all of the facilities in a hard drive crash, so I will not share more about them until I can rebuild them. Your horses' breeds? : Warmbloods and thoroughbreds primarily. Do you have your character in The Sims? : Yes, I do. Maggie York. She is the young owner of "York Equestrian" which specializes in english disciplines as well as breeding future show horses. Unfortunately, I have to remake her sim, so I plan on giving her a little bit of an overhaul. This is one of my favorite horses, prior to my hard drive crash. Luckily I have an old sim file, so I will be able to recreate this horse. Please, provide your equine screenshot.